Not everyone has a central hub just a few steps away from the beach, where they can find an assortment of restaurants and shops to fit their every need, but here on Hilton Head you can. At Coligny, you’ll find one of the island’s best beaches along with a plaza full of food and souvenirs, just across the street from the beautiful Atlantic waters. It’s the perfect place to go for an entire day – sunup until sundown. There’s even a movie theater in the plaza, if you need to hide from the sun for a few hours. So come and get out, grab some friends or family and head on over to Coligny for a great time! Out of the 12 miles of beaches on Hilton Head, Coligny Beach is by far one of the most popular destinations for vacationers and there’s a whole beach park to enjoy. In addition to the free parking and free Wifi, there are also swings, shaded gazebo areas with chairs, a water fountain that kids can run through and the beautiful, clean beach, of course. So if you’re on the island for a few days, be sure and make your way over to Coligny Beach for at least one day of fun in the sun! 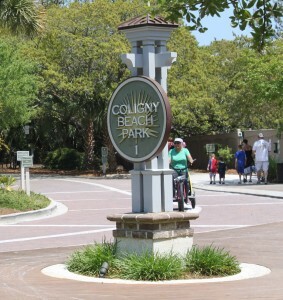 Located right next to Coligny Beach is Coligny Plaza. This shopping, dining and entertainment center is home to more than 60 shops and restaurants. Coming from a hot day in the water, Coligny Plaza is the go-to place for more exploration. Free parking is provided around the entire complex, or you can you use the free beach parking and walk across the street. 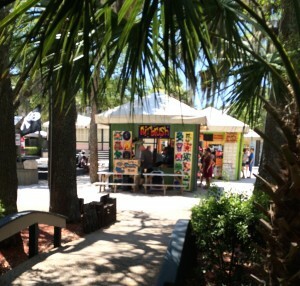 Hilton Head’s bike paths lead directly to the beach as well as the plaza, and bike racks are located all around.